Between 30,000 and 40,000 migratory birds, including about 15,000 wild gray cranes, come to the Meighan Wetland in central Iran every year. Due to the gathering of cranes in this wetland on November 6, the day has been called the National Day of Cranes. Cranes are dissociable, harmless, beautiful and lovely birds that collectively sing a stunning song while flying. They perform duet dance in the sky. They do not cause disturbances for people and farmers, nor do they expect humans to help them. They avoid people and die of sorrow when they cannot migrate because of diseases. 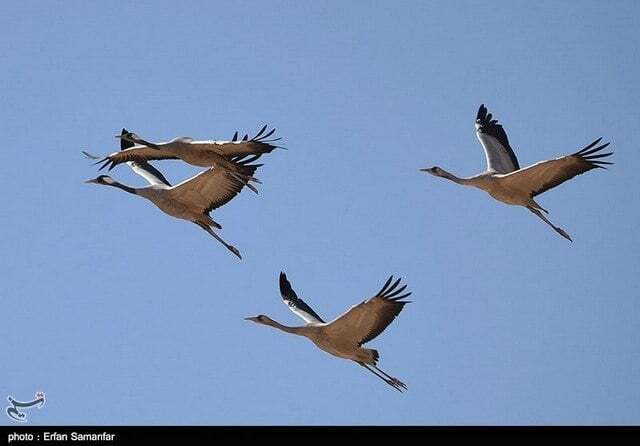 In recent years, these birds have been severely threatened and slaughtered by some Iranians. For this reason, the White Siberian Crane has been introduced as an internationally endangered species. Various protection programmes are being implemented in 17 countries of the region, including Iran, to preserve them. “Some migratory birds remain in this lagoon until spring, but some leave the area with the first heavy snowfall and migrate to the tropical southern regions,” he added.